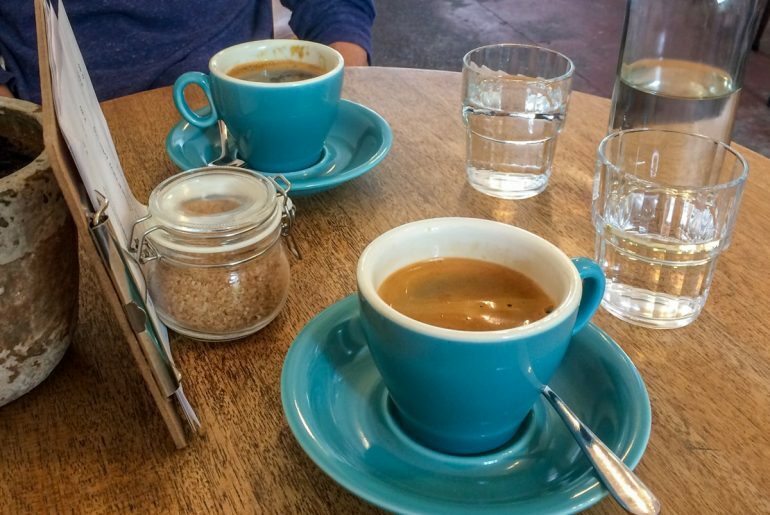 Here are Some of the Best Coffee Shops in Edinburgh! 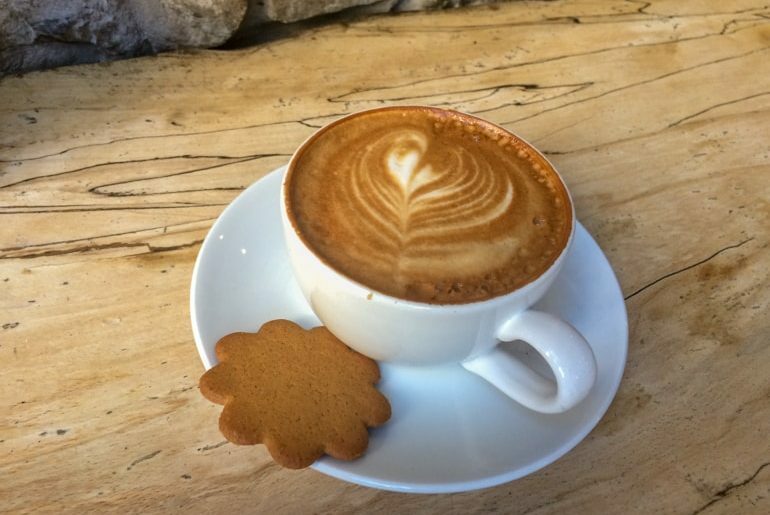 Whether you’re looking for artisan coffee shops in Edinburgh, a place to get work done, or just a simple cozy coffee shop to enjoy a hot drink, we’ve got a list for you! 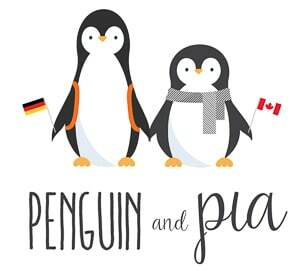 If you’re new to P&P – hi! We’ve both lived in Edinburgh (Eric for a year while studying abroad and Lisa on an internship) – so we know a thing or two about the city. Coffee shops played a huge part of Eric’s year studying his Masters and so we’ve become pretty well versed on the subject on where to get good coffee (and also get work done) in Edinburgh. 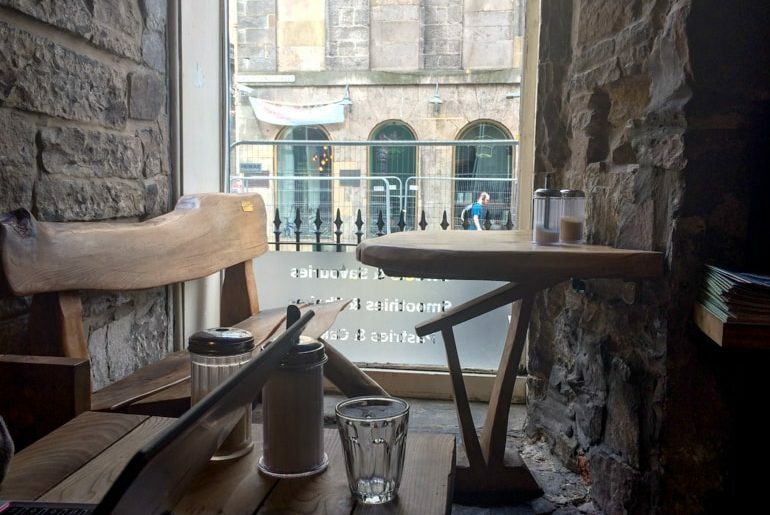 While there are lots of great cafes in Edinburgh’s city centre, some of the best places are outside the centre – more where the locals would venture to. You’d be fine having a coffee, latte, or tea in a cafe on Edinburgh’s Royal Mile but these places might be more expensive simple because tourist prices can be inflated! In any case, we’ve stuck to the more local places and included zero chain brands in the post below. 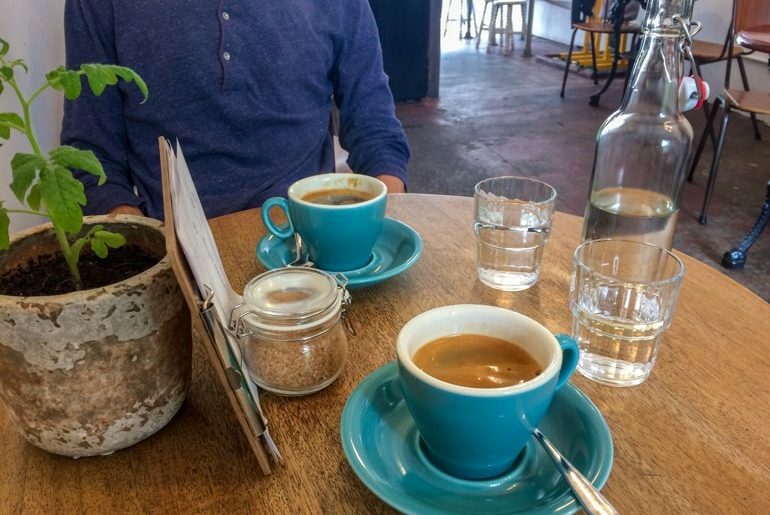 Some people already know about the big names in Edinburgh like Brew Lab Coffee or Black Medicine Coffee Co. – both of which we will talk about. Admittedly, Eric has a long history with Black Medicine and we’ll tell you more about it below. Here we are with Part 8 of the Ultimate Edinburgh Travel Series! If you’re looking for more guides on visiting Edinburgh, check out the other topics below. From day trips to bars and pubs – we’ve got Edinburgh covered! Part 5: Only Have One Day to Explore? A Day in Edinburgh is for You! 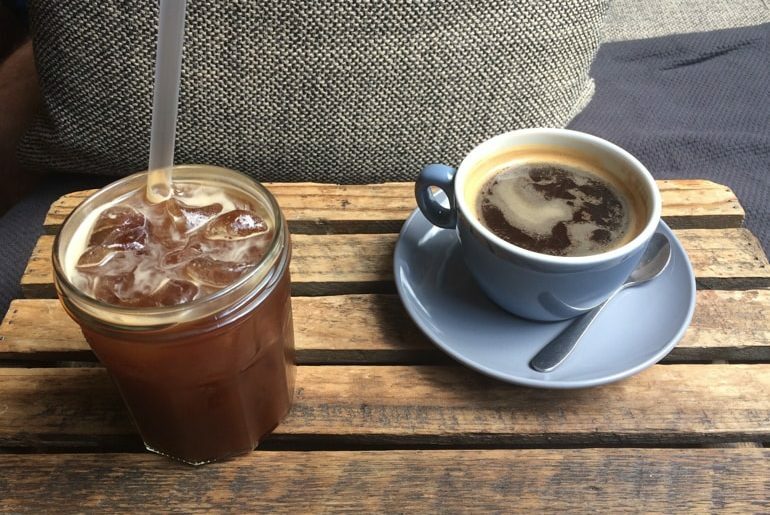 So, if you’re ready to discover the coffee scene in Edinburgh – here’s a short list of the best places to get your caffeine fix! Having walked the snaking street of Cockburn so many times, we missed the Milkman on previous trips to the city. This time, we weren’t so silly. Someone else described The Milkman as “Scottish Hipster” and we couldn’t agree more. This tiny place has a very modern and new atmosphere but it is still super cozy. With outside seating and a few tables and high stools in the small shop, most people end up taking their beverage away rather than sit in. We had a seat in the window and enjoyed a cold brew Americano and a Long Black – as you can see pictured below. We had been walking around all morning so sitting down to enjoy a coffee was a nice change of pace. The staff were super friendly and their glass case is full of good looking cakes and other baked items. The Milkman is definitely not a place you’d set up a laptop and work for hours – we will mention where you can definitely do that below. 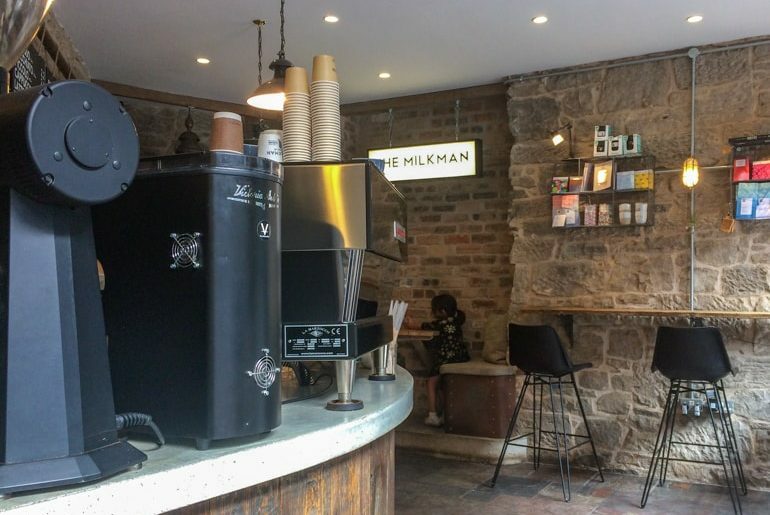 Go to the Milkman for really good coffee, nice Artisan vibes, and a rest while you’re in the heart of the busy city. It is close to Waverley Train Station (like many others on this list) so make it a first stop when you arrive! Oh, Black Medicine. It’s fitting that as we type this we are physically sitting in Black Medicine. It’s funny how life works out sometimes. What you need to know about Black Medicine is that it’s a cozy shop with so much character, crazy friendly staff, great vibes, and good coffee. They also have light food like paninis and bagels and do great smoothies, milkshakes, and other drinks. If you need a place to go and set up shop to get work done for a few hours, Black Medicine is the place to do it. The wifi is open and very strong and consistent on the top floor. We’ve never sat downstairs so can’t speak for down there – but there is additional seating if the top level is full. The nice thing about Black Medicine is there are lots of different seating options for your style of work space. They have large tables, bar/high stool areas along the windows, little cubby-hole style benches with their own tables (shown below), etc. The wooden seats are actually quite comfortable and there are plugs in many places for charging your electronics if you need. All in all, we love Black Medicine. It became a second home for Eric during his time in Edinburgh – and the owner even has a live cactus in the front window with the name “Eric” on the side of the pot. It holds the spot where he sat and wrote all his university papers. That is, until he’s back in Edinburgh to claim his stool as a “regular” again! Be careful if you go to Black Medicine, you may never leave…. We ended up a Cockburn Cafe while out for a quick breakfast with a friend who was passing through the city. If you look at the photos on Google, you’ll probably see what the place looked like before it was renovated. So, you should know that it was recently renovated and it looks way more welcoming now. Also located on Cockburn Street, this place does sweets as well as full on food/meals. The coffee was pretty good – Lisa had a green smoothie and she really liked it. Eric had a basic filter coffee and it was also pretty big considering the price. The servers were quite nice and the place was fairly busy considering it was the morning hours! 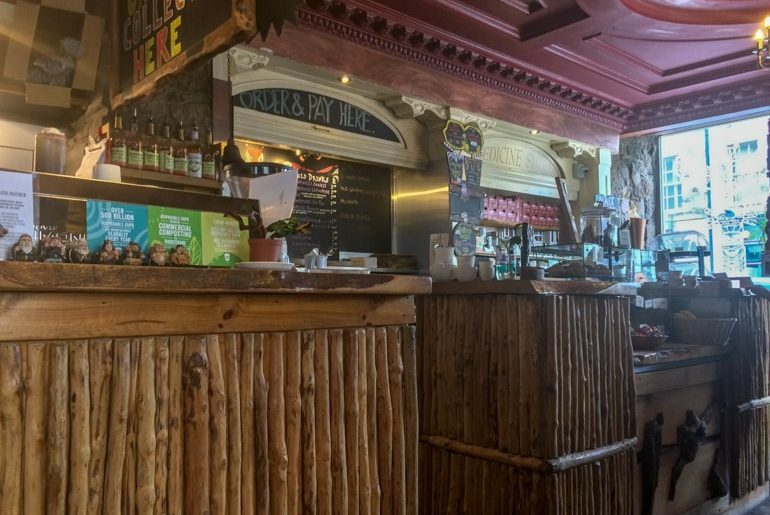 If you need a no-fuss place for a quick bite going to or coming from Waverley Train Station, then perhaps Cafe Cockburn is for you! If you ask a student in Edinburgh (and there are many) which place they like to work in – you’ll likely get two answers: Black Medicine or Brew Lab. Eric was a Black Medicine guy but he knows lots of people who pledge their allegiance to Brew Lab. To each their own- both places have different vibes that work for different people. Eric studied back in 2015/2016 and – while he walked by Brew Lab many, many times – he never went! It’s also very close to Black Medicine. So, when we went to Brew Lab to check it out to be able to write this post – it was actually the first time Eric had been. Ever. Only took 3 years. The place is very nice. It’s much larger that it looks from the sidewalk – with lots of tables and high stools to work at. There are quite a few plugs, too. The drinks were really good – Eric had a flat white while Lisa had a nice tea that she really enjoyed. Like with many of the smaller cafes, they also do sweets like cakes and a few light food items like baguette sandwiches. The ones we had (a pastrami one and a brie one) were very good and surprisingly filling. The staff were very friendly and it was full of people working away. Admittedly, the wifi wasn’t great – their login was okay but the redirects kept logging out so we didn’t get as much done as we wanted. In that case, I’d go with Black Medicine but maybe it was just our computers. Try both and let us know what you think! 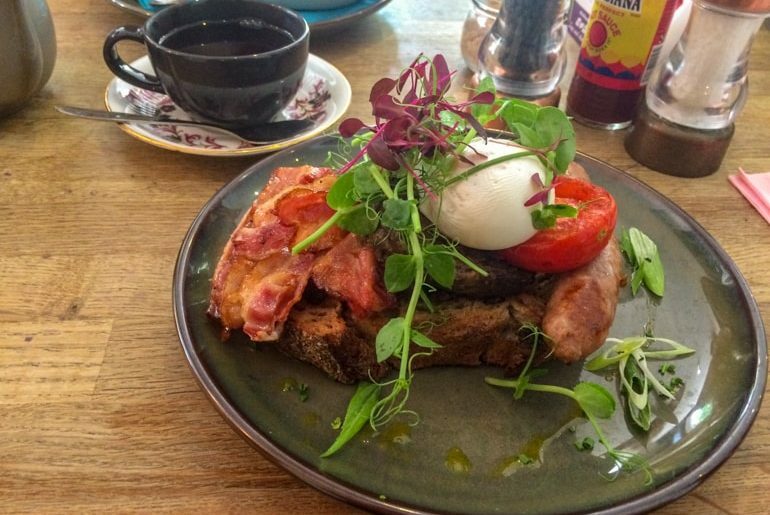 If you ask someone where to get really good brunch in Edinburgh, one of the typical answers might be “The Pantry Stockbridge”. That answer would be correct. However, what we didn’t realize was that The Pantry is also a great place for a coffee and a treat! Located in the north end of New Town, The Pantry has a great set up. Lots of large tables inside and two seater patio tables on the outside. Inside, there’s a full menu but what caught our attention was the cakes and sweets at the front counter along with their hot beverage menu. We went for brunch but also had an Americano and Lisa had a tea. Everything was excellent. Since it’s more of an eatery, you wouldn’t work here. 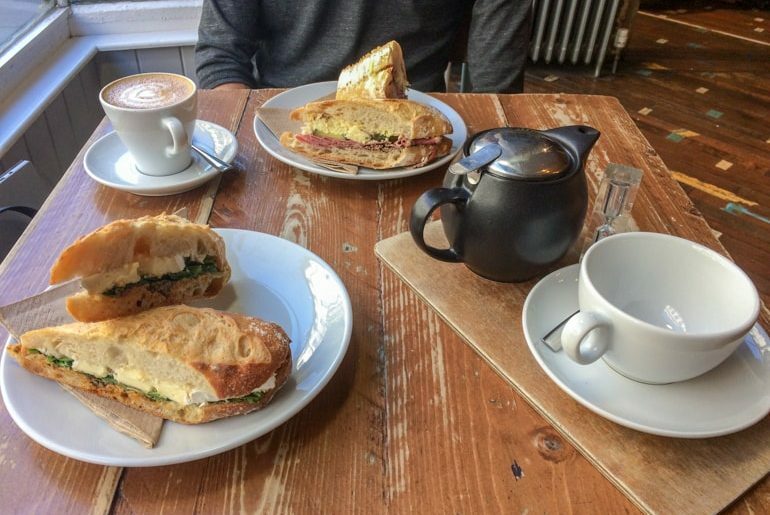 That said, we wanted to include it as a nice cafe option if you’re exploring the top photo spots like Circus Lane or Dean Village in the north end of Edinburgh! If you’re going on a weekend, go early because they DO fill up! Filament is the kind of pop-up cafe with a great minimalist style that you walk by and go “oh, when did that come about? We should go.” Then we went – and it was great! Located in the south end of Old Town, Filament is a simple cafe with a nice decor and good coffee. We both had an Americano but they have nicely done filter coffees, flat whiles, the usual cappuccinos and espressos, and then a variety of cold beverages and smoothies. The front counter has loads of sweets and cakes. When we were there a woman beside us ordered a HUGE slide of banana bread and we were very jealous we didn’t get one. The staff were very nice, too. If you sit in, they come to you and bring a bottle of water with glasses so that was a nice touch! We didn’t work while there but we’ve walked past and seen lots of people on their laptops and they do have plugs so we know it’s doable. Can’t speak for the wifi but with that many people working one would have to assume it’s decent and available! Southern Cross is certainly more of a food place but you can absolutely stop in for a coffee and something light or something sweet. Also located on Cockburn Street, it’s just down from the Royal Mile. The story goes that we got off the AirLink (bus from the airport into the city centre) and were really hungry early in the morning. Walking up Cockburn, we stumbled across Southern Cross which Eric hadn’t really noticed before. We made a quick assessment and headed inside. Best decision. Ever. We both had a filter coffee which was great and we also ordered full breakfasts. 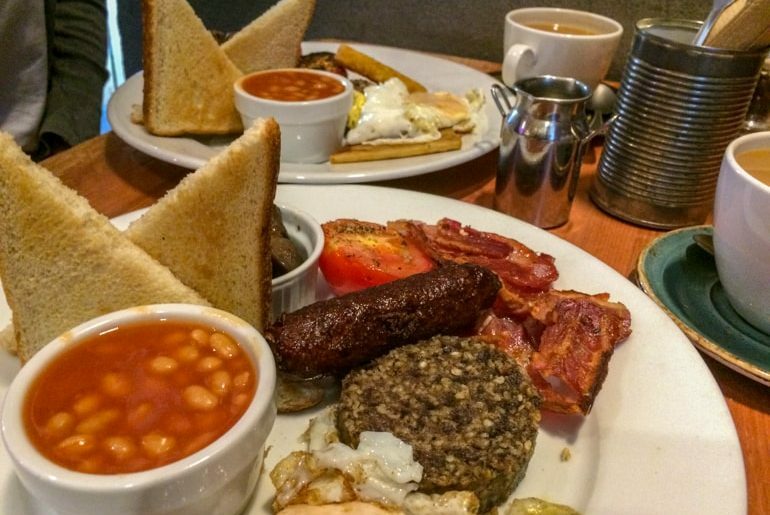 Eric had a full Scottish Breakfast (with haggis, featured above). Lisa had a full veggie breakfast because it came with more potato. She really likes potatoes. Both were delicious. The staff were super nice and the place itself has seating on two floors plus an outdoor area in front with quite a few tables for those passing by. 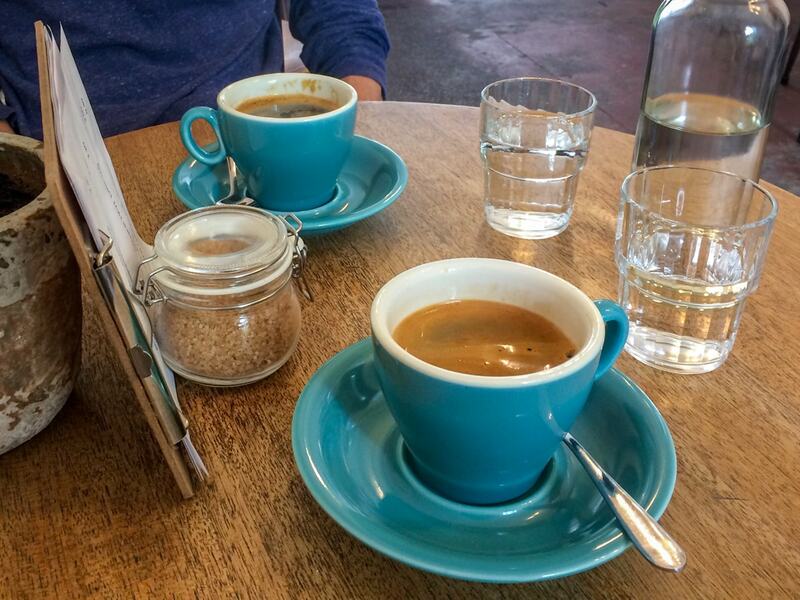 We’d recommend Southern Cross for food or a coffee, and it’s probably not a cafe for working at. 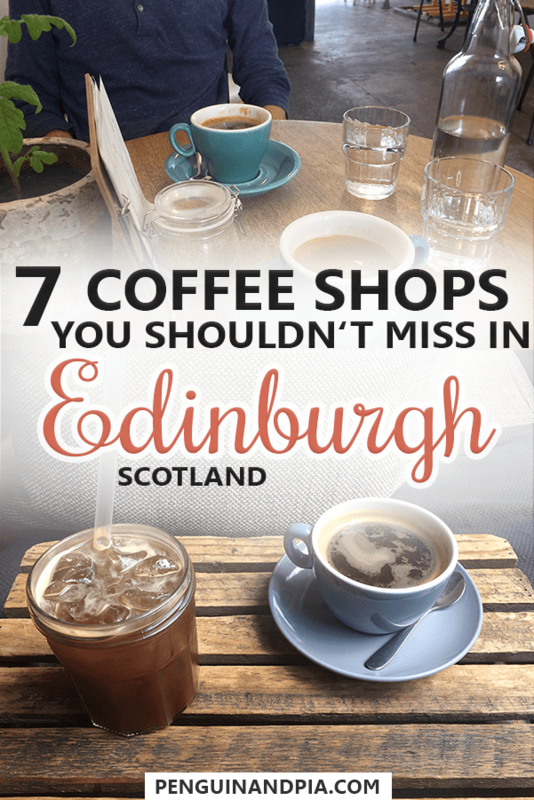 And there you have it – some of our favourite coffee shops in Edinburgh! There are just so many that we obviously couldn’t cover them all – but we think we’ve brought you a good selection of the ones that are a little less touristy and out of the main areas. What did you think? Did we mention your favourite? Or have we missed the hidden gem in the city? Get in touch and let us know!